A traditional bed consists of a mattress that rests on a box spring with a rigid frame that rests on the rails of a bed frame. 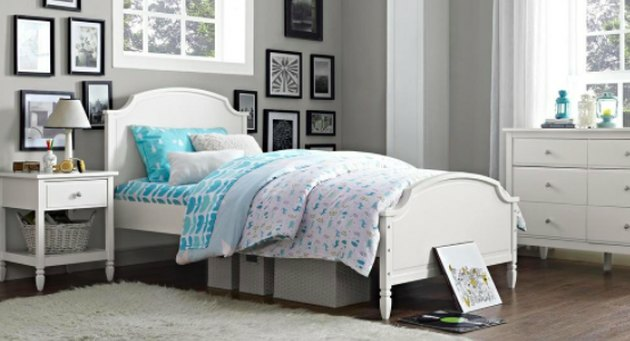 At one time, a box spring was necessary since most mattresses were structureless pads that were unpleasantly hard to sleep on without some kind of spring system to support them. Modern mattresses, though, usually have inner-spring structures, which means they no longer really need box springs. It's now quite common for a high-quality mattress to rest on a platform of plywood placed directly on the bed frame. Alternately, the mattress sometimes rests on a closely spaced series of slats placed across the rails. A traditional bed frame can be fitted with a platform to support a mattress without a box spring. Platform beds have certain advantages. The overall height of the bed is lower than a stacked mattress and box spring, which can be an advantage for children or older adults. A platform bed can also incorporate storage features into the platform itself – a useful feature when storage space is at a premium. Rather than abandon the old bed frame, which may well be an expensive piece of furniture that matches a bedroom ensemble, it's quite easy to convert a box springs/mattress bed to a platform bed. With both methods, you'll be disposing of the old box springs altogether, but keeping your bed frame. Then, you'll use one of two methods to create a platform on which to rest the mattress. A good quality mattress with a solid internal structure can rest on a series of closely spaced slats that run across the bed frame, resting at each end on the bed frame rails. This method has some advantages because the narrow gaps between the boards allow the mattress to breathe. Remove the mattress and box spring. Dispose of the box spring. Measure the distance between the edges of the bed frame. Subtract 1/8 inch. Cut a 1 x 4 pine board to this length. The number of boards you'll need depend on the length of your bed and on the spacing you choose. Insert the boards into the bed frame, leaving gaps between boards of about 1 1/2 to 2 inches. Place the mattress on the new slat platform. A solid platform of 3/4-inch plywood can serve as an adequate platform for your mattress. It's preferred by some people because it creates a more rigid platform; however, it does not breathe as readily as a slat platform. Make sure to use 3/4-inch, not 1/2-inch plywood, since thinner plywood may bend and collapse under the weight. (Two thinner sheets, can, though, be glued together to make a thicker platform.) A "finish-grade" plywood with a smooth face will be easier on the fabric of your mattress. Plywood is sold in 4 x 8 foot sheets. For beds wider than 4 feet, a single sheet of plywood won't be big enough, so you'll need two sheets of plywood for a queen- or king-sized bed. Remove the mattress and box spring from the bed frame. Discard the box spring. Measure the distance between the edges of the bed frame rails and the length of the bed from head to foot. Subtract 1/8 inch; then cut a sheet of plywood to this measurement and place the piece in the bed frame, resting it on the rails. If your bed requires two pieces of plywood, place the larger piece at the head of the bed, with the smaller piece at the foot. Place the mattress on the platform.